Graco's FDA pumps, high sanitation diaphragm pumps, transfer pumps and drum and bin unloaders are used in many sanitary processes. The SaniForce 12:1 Sanitary Drum Unloader features an on-demand workflow capability and can be taken apart quickly for applications that require frequent sanitation. Ideal for materials with poor flow characteristics the SaniForce 12:1 transfer pump is ideal for materials that usually require ram pressure to level the product and feed the pump inlet. Evacuates barely flow-able products from their original 55-gallon containers without diluting the material! Ideal for the most demanding food-related applications. The SaniForce 5:1 Sanitary Drum Unloader features an on-demand workflow capability and can also be taken apart quickly for applications that require frequent sanitation. 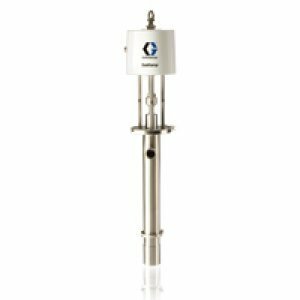 The SaniForce 5:1 transfer pump is constructed of 300 series stainless steel, with a 2 inch (50.8 mm) sanitary tube flange outlet. Graco’s SaniForce drum unloaders can evacuate medium to high viscosity products from their original 208 liter (55-gallon) containers, in less than 5 minutes – without diluting the material. Graco's new SaniForce 6:1 quick knockdown piston pump is constructed of 300 series stainless steel, with up to a 6 inch (15.2 cm) clamp pump inlet. The air motor improves serviceability, increases efficiency and offers a lower cost of ownership.